During an evening he called “uplifting,” Bishop Lawrence Persico celebrated Mass at SCI Mercer on Aug. 2. At a Mass attended by more than 40 people, two men received the sacrament of baptism, while four received confirmation. During his homily, Bishop Persico emphasized that all of us face difficulties. He noted that Christ’s life wasn’t all healing and miracles. Bishop Persico encouraged the men present to turn to Christ in moments of loneliness or sorrow. 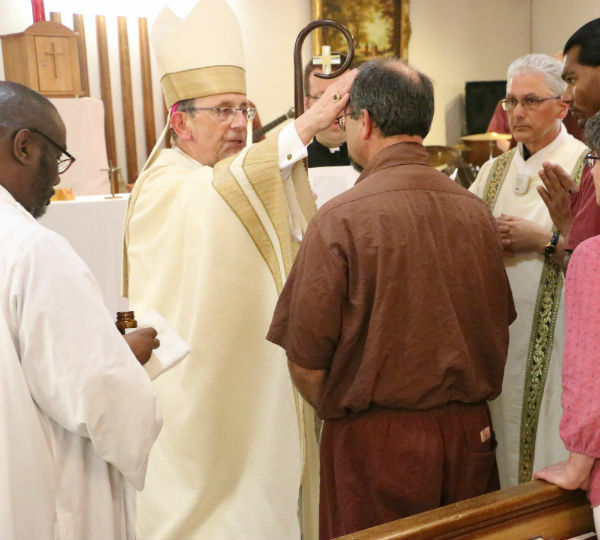 Before baptizing and confirming the men who had requested the sacraments, Bishop Persico encouraged everyone at the Mass to use the opportunity to renew their own baptismal promises and commitment to Christ. Bishop Persico was the principal celebrant at the Mass, which was concelebrated by Father Matt Kujawinski, pastor of Immaculate Heart of Mary Parish in Mercer. Deacon Ed Horneman, chaplain at SCI Mercer, read the Gospel. His wife, Diane, served as sponsor for one of the men who received confirmation. Father Michael Polinek, director of vocations for the Diocese of Erie, was the master of ceremonies. Two inmates were altar servers, and a choir of several prisoners provided the music, singing with great enthusiasm.